Wash and soak the dhal for two to three hours. Drain the water completely and add one teaspoon sombu, one cinnamon stick and half teaspoon salt and grind to a coarse paste like vadai dough. Put this into idli plate and steam it for ten minutes. Remove and cool it. Break it into small pieces like pakoda. Keep aside. Chop onion and green chillies lengthwise. Chop the tomato finely. Crush the ginger and garlic. In a kadai put the oil and when it is hot add remaining sombu, cinnamon stick, cloves, cardamom and bay leaves and fry for a while. Then add onion, green chillies, curry leaves and fry well. Add ginger and garlic and fry for a while. Then add tomato pieces and fry till it mashed well. Now add chilli powder, coriander powder, turmeric powder and salt. Mix it well. Add the dhal pieces and stir well. Add a cup of water and allow to cook in low flame. Remove from fire and garnish with coriander leaves. Note: You can also add a cup of coconut milk instead of water or half cup coconut milk and half cup water. 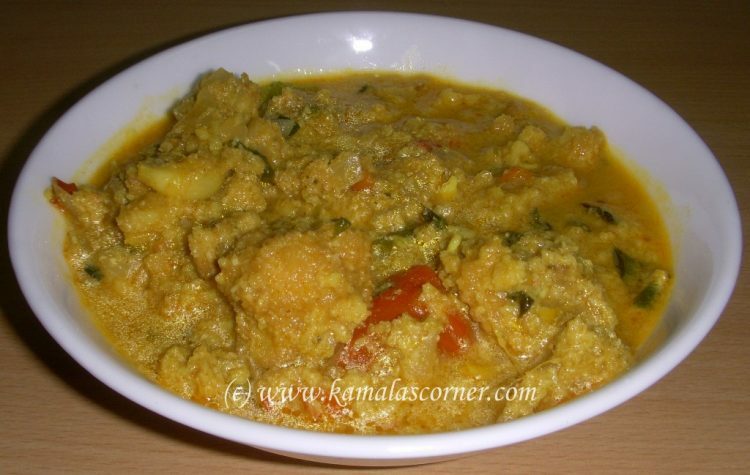 I have steam cooked the dhal paste and used in this curry. Instead, make small vadas from the dhal mixture and deep fry. Then add it into the curry. Hi madam, have tried this recipe this evening and it came very well.